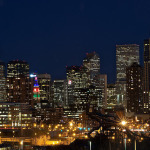 Amy Angelilli plans a perfect date night for the Denver/Boulder area. Whether we explore the local brews or snuggle up, Colorado has something for everyone. There’s more to do this holiday season than attending your company holiday party or fighting through the crowds at the mall! Dig a little deeper and you’ll fine local brews, art and chocolate waiting to be enjoyed day—or night. Be sure to pick up a locally handmade sweater to keep cozy—or not, as maybe it’s more fun to snuggle up together to keep warm. Whatever the case, skip the lines at the movie theater and bypass the family crowds at the holiday parade, these locally inspired gems offer a little something unconventional for your holi-date. In the tradition of a German market, this offers the opportunity to shop for handmade holiday decorations, pottery and crystal while also sampling amazing German food and experiencing German music and dance. It also gives you the opportunity to pretend you’ve gone off to Europe for a weekend! Now, that’s romantic. Sixty-five local crafters and small businesses will set up shop so you can have a last minute holiday shopping spree date! Plus, some of Denver’s best food trucks will be there to keep you fueled. If both of you are counting down to spring, when you can hit the road again, visit the largest RV show in the Rockies. Besides showcasing the many ways you can execute your dream road trip, there’s also a sampling of campgrounds and travel destinations to check out as you design your perfect RV. Kick off the New Year with a romantic treat—literally! At this event, you’ll be creating your own chocolate dessert samples. Consider it your Valentine’s Day sneak peak. A love story for the digital age, Pixelated presents a multimedia dance concert based on the story of Pygmalion. Think loss, love and passion combined with digital effects and a dance performance. This is not your grandma’s date! According to event organizers, “This is a magical weekend when the Norse God of snow comes to town to raise his drinking horn to craft beer, bluegrass music and a Colorado crowd who knows how to have fun in winter!” Yes, please and why is this only the first year for such an amazing winter date marathon? It’s really hard to go all winter without attending an event at Red Rocks—once listed as one of the Seven Wonders of the World. Now you don’t have to as Winter on the Rocks gives you an opportunity to enjoy the venue that music awards are now named after while getting cozy because it’ll be cold… real cold. Upgrade your ticket and you can snuggle up together in the VIP Warming Hut and Lounge. Amy Angelilli: Chief Adventure Officer – The Adventure Project Amy Angelilli’s own adventure project began when she turned 40 while on safari in South Africa. Realizing she had veered off the path of her “right life,” she returned determined to make major changes both personally and professionally. In the first half of 2012, she left her relationship, her house and her job. In the second half of 2012, she married the love of her life–one year to the day she unveiled an authentic, heartfelt profile on a dating website. Her latest creation is The Adventure Project, which offers relationship, life and travel adventures to the Every Person via play. When not playing or navigating adventures, she can be found enjoying meaningful travel, restorative yoga or improvisational theater. Her greatest performance is as herself in “It’s All About Amy”–the unscripted story of her life. She also created and produced the theater experience “3 Blind Dates”–Denver’s only unscripted romantic comedy that showcases the phenomenon of modern dating. Follow her authentic adventures on twitter or via her blog and you just might find your own adventure!